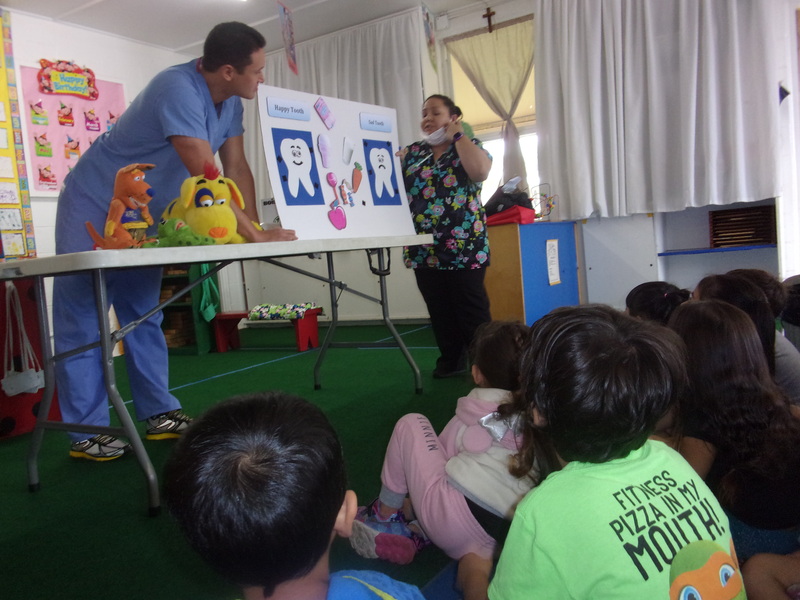 National Dental Health Month - the students got a visit from the dental team at Mālama I Ke Ola Health Center. The students learned how to properly brush, healthy food choices and how often you should brush your teeth. The children were blessed with free tooth brushes, floss, stickers as well as gloves and masks so they will feel at ease when they see the dentist. We would like to thank Ladybug student Tevai Demello, Orta Kuba's mother Rae Orta, and Dr. Mike for sharing their time and expertise with the children. Catholic Schools Week - In celebration of Catholic Schools Week the students of St. Joseph Early Learn ing Center started their Spirit Week with "Crazy Hat Day" on Monday Jan. 28th. Pictured in the photo are the students sporting there hats displaying their whimsy and uniqueness. 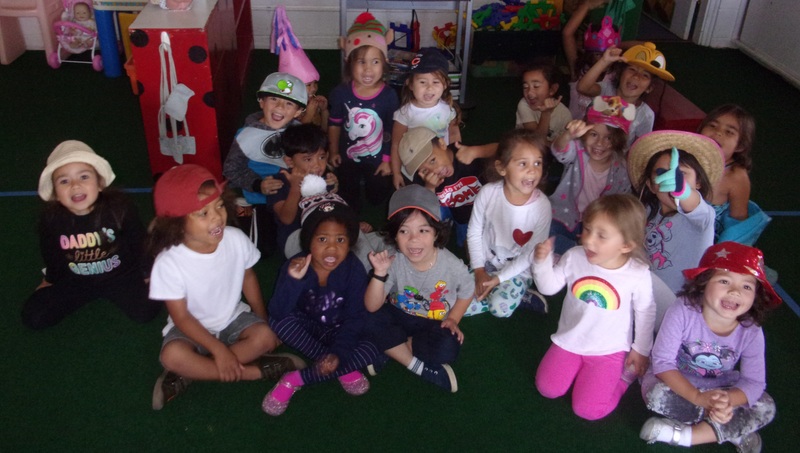 On Tuesday, they enjoyed dressing up as a career they would like to be when they grow up. It was called "Career Day." For Wednesday, the student body cozy-ed up for "Pajama Day" and on Thursday the students took part in a Trike-a-Thon fundraiser for their school. The children raised almost $1,900.00 for the days event. They enjoyed riding their bikes around the school and working together.The week ended with a county - wide mass and workshop at St. Anthony Church in Wailuku for all staff, administration and personal. Thank you to all for your dedication and support of Catholic Education in Hawaii. Christmas Program - "Jingle Bells" this is the frist song that the students of St. Joseph E.L.C performed for their Christmas Program on Dec. 20th that ended the first half of their school year. Despite the rain the children sang with their hearts filled with the excitement of Christmas. Parents and 'Ohana were well attended so supportive despite the weather. 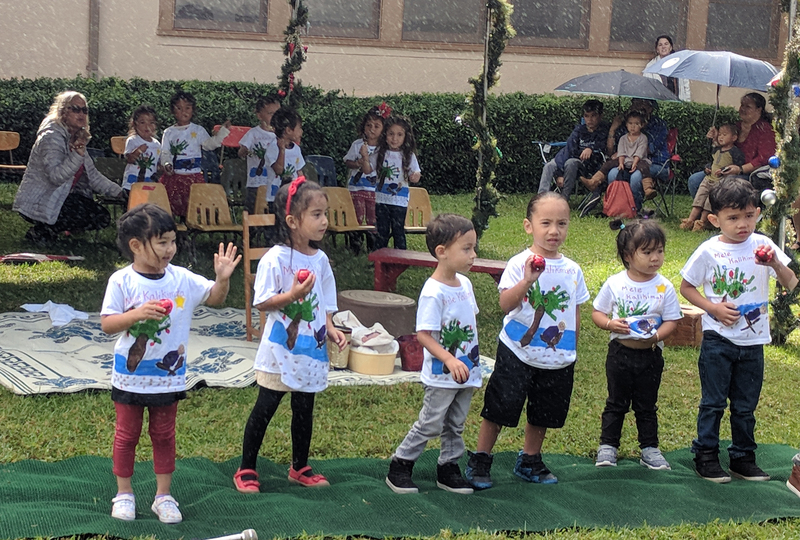 The T-shrits worn by the students were hand made literally with individual hand prints and thumb pints to depict Baby Jesus under a coconut tree and read with the title theme of the program: "Mele Kalikimaka" The children also preformed a nativity play as well as nine songs, five of which they also preformed for the patients at the Kula Hospital the week before during their caroling filed trip. You could say the children ended their year with the true spirit of Christmas. Halloween - The St. Joseph E.L.C. students got a blessing from Fr. Jaime Jose and Deccan Pat Constantino before they began their Halloween Costume Parade through the neighboring Makawao Town. It has been a tradition at the school for over forty five years. After returning from their walk the children learned of the winner from the Halloween Pumpkin contest. This years top winner was Ladybug Student Jade Ribucan. The students then returned to their classrooms to partake in trick-or-treat goodie pass out and games. Thank you Fr. Jose and Deccan Constantino and all the parents and 'Ohana that helped with the events. Ordination Banner - The St. Joseph E.L.C. students presented Fr. Michael Tolentino with a banner and a lei for the celebration of his 14th Ordination Anniversary. The banner was also used at Fr. Mike's potluck dinner following his Ordination Mass on Oct. 2nd at 5 p.m.. 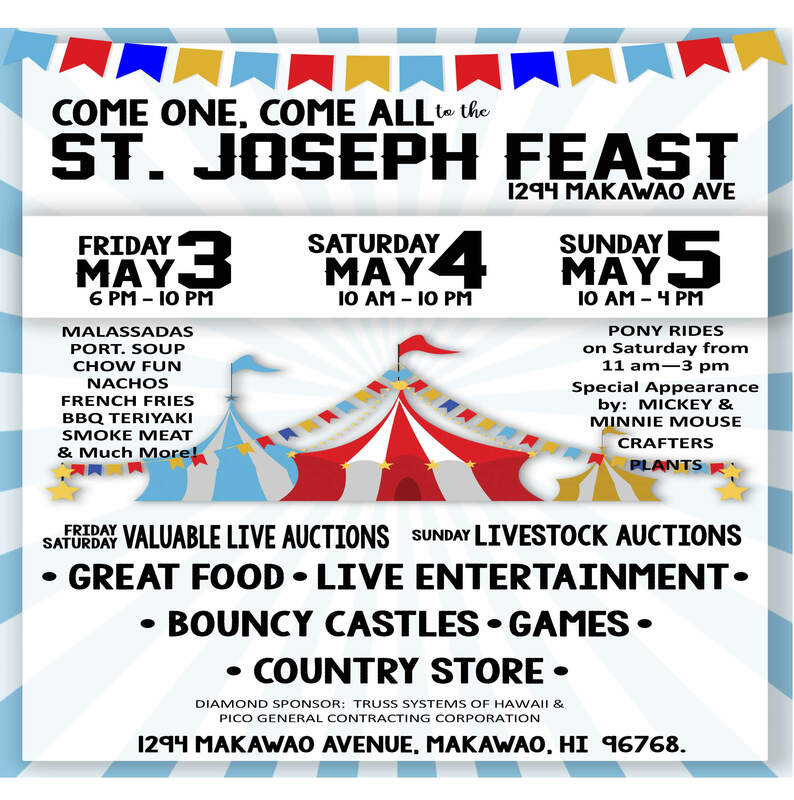 It was well attended and and great way for the parish to get to know the new Parochial Vicar for St. Joseph Parish Makawao. Best of blessings be upon you Fr. Mike and thank you for your sacrifice and shepherding God's flock. Staff Retreat - The Staff of the St. Joseph Early Learning Center enjoyed fellowship, blessing and renewal from their recent staff retreat. The retreat took place on Friday, Sept. 14th at St. Joseph Convent Chapel and mass was celebrated by Fr. Jaime Jose. The theme this year was "The Good Steward". The teachers and religious education coordinator was inspired by the DVD entitled "Long Term Stewardship Development" featuring Rev. Jim Golka, Pastor of St. Patrick's in North Platte, NE. After viewing the segment the staff got to meditate on how to best use their time talent and treasure as a way of life and giving back to God and how to instill that philosophy to their students. To close the day the group enjoyed some meditation, yoga and a delicious lunch. Pictured in the photo is Alicia Cordiero, Renette Koa, Helen Souza, Fr. Jaime Jose, Arneda Wilson, Sheri Harris and Mahealani Cavaco. Mahalo to Mark Clack at the Diocese Office of Stewardship and Development, also to Fr. Jose for helping to enhance the retreat for the staff and to St. Joseph Parish for your hospitality. God bless. Welcome Back - Welcome back Ladybugs and Butterfly Class…we are off to a good start as we begin the year with our Parent Orientation Night that took place on Aug. 2nd 2018 at 6 p.m. Our staff read a book that will be introduced to the students to help them transition for the first day of school. The parents also will bring in a family photo that correlates with the books character bridging school and home. The night was well attended and informative helping to make the year go smoothly. Thank you to all who attended. Happy Back to School 2018!